Decorated with local artwork, the stylish G Tower Hotel presents panoramic views of Kuala Lumpur from a prominent location in the center of the city. Free Wi-Fi and 2 infinity pools are available. G Tower is only 270 yards from Ampang Park Train Station. 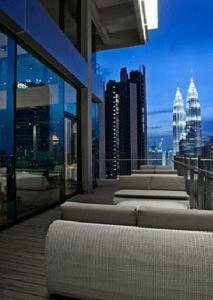 A 10-minute walk will take guests to KLCC Park and the famous Petronas Towers. Spacious and contemporary, each room at G Tower Hotel features a luxurious marble bathroom and 2 flat-screen TVs. Equipped with walk-in closet, rooms also come with an iPod dock and a well-equipped minibar. Refreshing workouts can be enjoyed at the fitness center, or simply relax and enjoy city views from the waters of the infinity pools. State-of-the-art business facilities and free parking are also provided. The eco-friendly Bridge Bar serves drinks from a modern structure suspended between the hotel’s 2 towers. Gourmet Western dishes are specially prepared at Tanzini, while Food Hive offers a selection of Asian and international food.